Happy December to you! In other words, happy month of buying that perfect present and wrapping it just right. 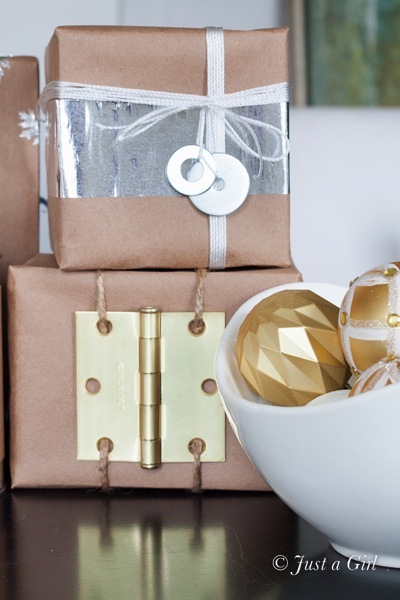 Part of my monthly challenge with Lowes is to show some gift wrapping alternatives. I was all over this one ’cause Lowes has plenty of cool things to use! 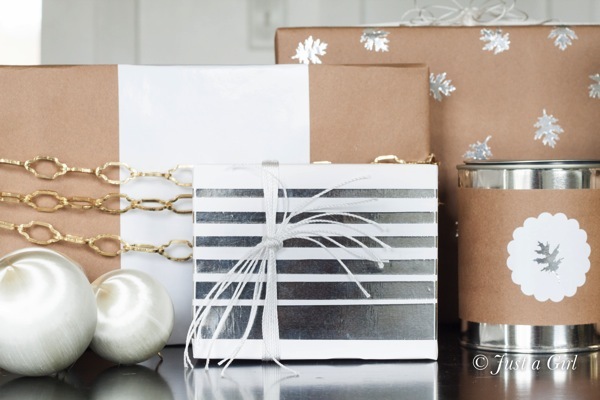 Don’t get me wrong–Lowes offers plenty of beautiful paper and wrapping supplies, but I wanted to show how you can get creative with things. It’s especially cool for the guy in your life that wouldn’t appreciate the glittered reindeer or foil wrap anyway. Everything in these pictures is from Lowes. 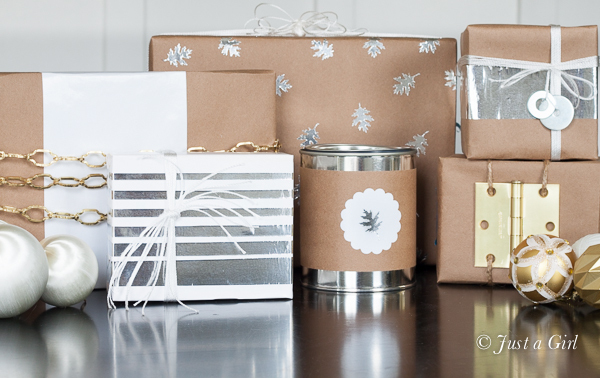 I used paint cloth paper, some foil tape, string, washers–all kinds of random things–to make it festive. Pretty cool, eh? I used a paper punch to make all the leaves, but you could easily just make some polka dots or more stripes. It was fun finding creative ways to implement basic supplies! Who knew a door hinge could look so festive? Disclosure: Lowes provided me with a gift card to showcase this project as part of their Lowes Creative Ideas Bloggers’ team. All the thoughts and opinions are certainly my own. I don’t get gift cards for those. You’re a creative genius. Love the ideas. 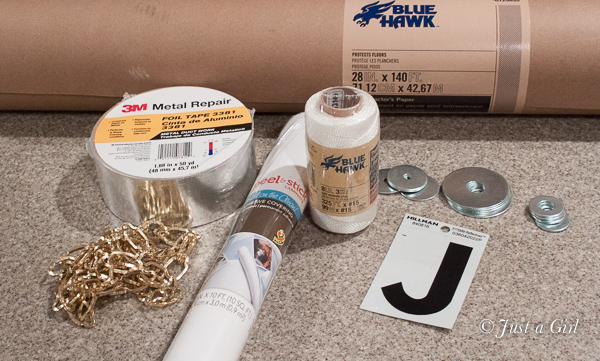 Especially love the 3M Metal Repair Tape. Boy, can I use that lots of ways! These are awesome! I love the chain and the foil tape. I can think of so many uses for that stuff. 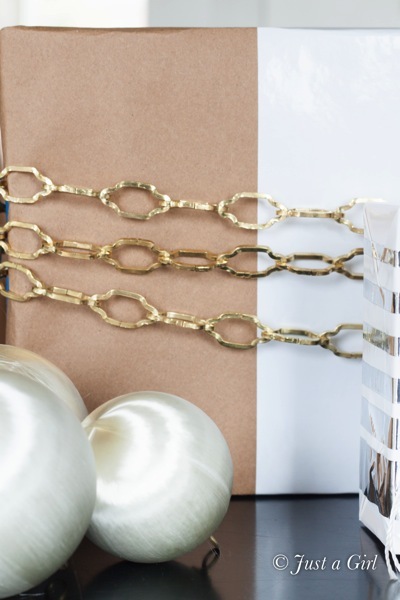 Oh I love love all of these wrapping ideas!